Normally, Positions would only be deleted when you are in the process of setting up your account and you have not set up any schedules you want to keep. Only the main manager on the account can delete Positions. Deleting Positions is NOT normally recommended once you have started scheduling. When you delete a position, it removes that position label and ALL SHIFTS for that Position and it also removes all those shifts from any templates you have saved. This cannot be undone, once you choose to delete a Position those shifts cannot be brought back. If instead you simply want to delete all the shifts on a week for a Position, you can go to that week in the Schedules section, filter your Schedule View to only include that position, and then click Clear/Delete. 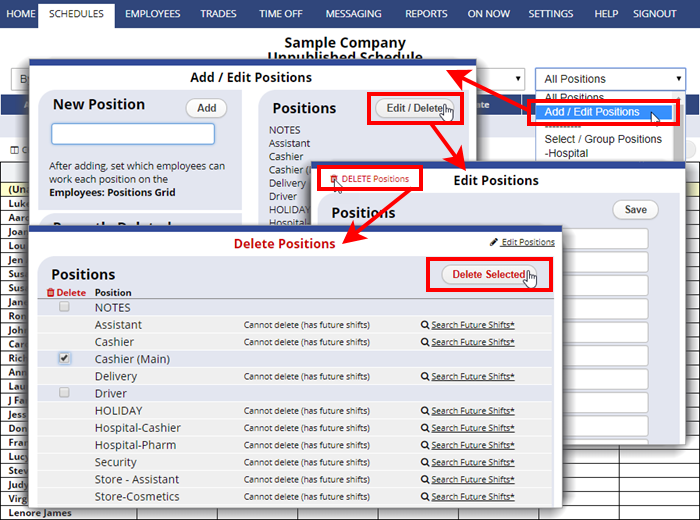 * You cannot delete positions that have shifts in the current or future schedules. ** If you are trying to delete shifts for a certain week, please use the Clear button on any Schedule View instead.